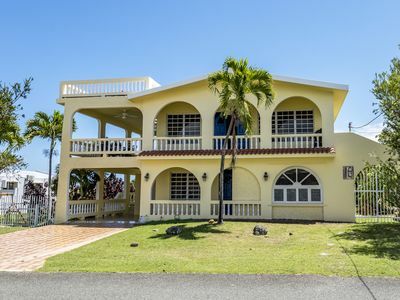 "Villa del Sol" is a delightful, modern villa with a 2BR Penthouse and two connected 1BR apartments perched high above the ocean just a 5-minute walk from two beaches. Fully gated, it has a paved drive & parking and an inground pool. 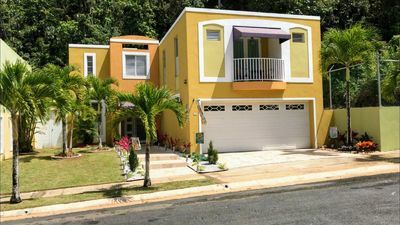 Rented together, Villa del Sol's 4 bedrooms and 4 full baths provide a an elegant and private setting for larger families or groups of up to 10. 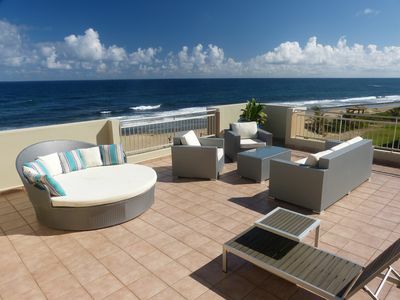 Sunny and welcoming, it has panoramic views of the ocean and nearby islands. The villa has A/C, a wonderful kitchen, 4 flatscreen TVs, cable & WIFI. 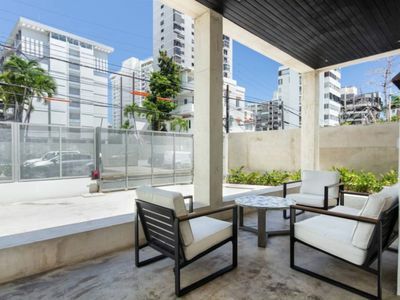 "Villa del Sol" is a delightful, modern villa with a 2BR Penthouse above and two charming 1BR apartments below. 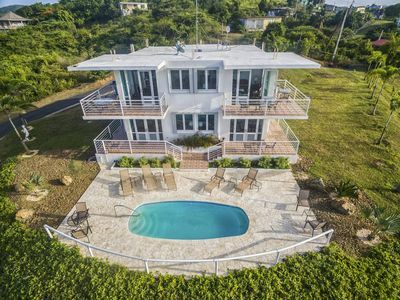 It is perched high over the ocean just a 5-minute walk from two beaches. Fully gated, it has a paved drive and parking, and an in-ground pool with panoramic views. 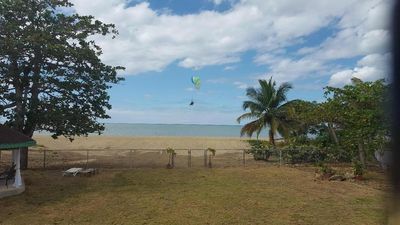 Since this is only our second full rental season and we don't have as much feedback for you to rely on as some other properties yet, we have priced Villa del Sol very competitively. We think you will find it to be a great value. 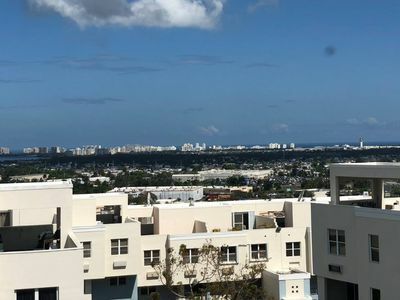 The upstairs 2BR Penthouse is a wonderful apartment with a 32-foot expanse of glass and spectacular views of the pool, ocean, and islands beyond. 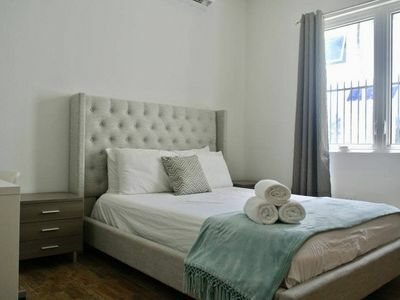 Newly decorated with new furniture and furnishings, it features a master bedroom with king bed and en-suite bath and a second bedroom with twin beds (can be combined into a king) and its own full bath. The spacious open plan living room, well-appointed gormet kitchen (with 5-burner gas stove, microwave, refrigerator, and Calphalon cookware) and full dining area overlooking the ocean will take your breath away. The apartment has an open floor plan that maximizes light and the spectacular views. The full kitchen is open to the dining and living areas, all of which open onto 60 lineal feet of decks overlooking the ocean. 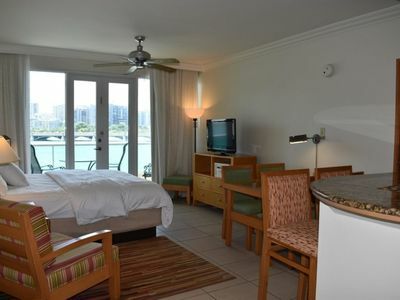 Downstairs, the two interconnected 1BR apartments are tastefully furnished with everything you need for your stay, including bedding, towels, and beach towels. Each has a king or two twin beds plus a sofa bed. Each has a fully tiled bath with walk-in shower. 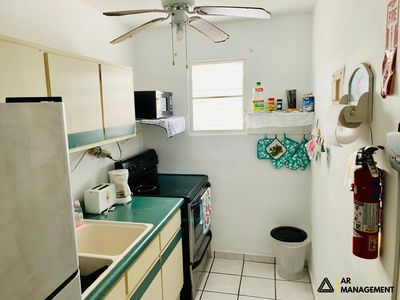 Both floors feature a washer and dryer for your use. 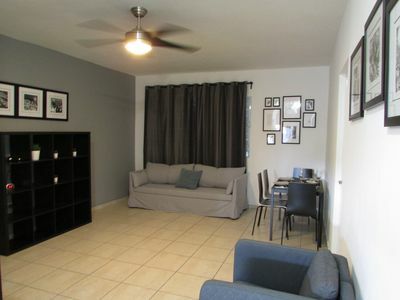 Each unit has its own seating area, table, and kitchenette. The villa opens onto a spacious coralstone patio surrounding an in-ground salt water pool with outdoor shower, bordered by palm trees, and overlooking the ocean. Lounge chairs and both gas and charcoal grills are supplied. Beach chairs, beach umbrellas, coolers, boogie boards, and snorkeling gear are also provided for your use. 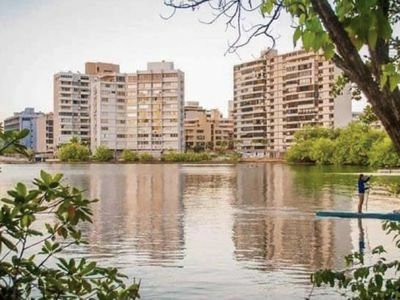 The majority of visitors to our villa take a morning flight into the San Juan International Airport (SJU) from their home city and then a 25-minute small airplane flight on Cape Air or Seaborne Airlines from SJU to VQS. 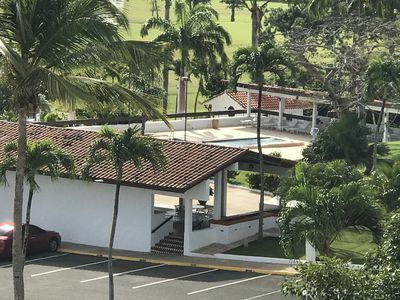 Another option is to take a 20-minute cab ride from SJU to the other airport in San Juan, San Juan Isla Grande (SIG), and fly to VQS on Vieques Air Link or Air Flamenco. The flights from SIG cost less than from SJU. 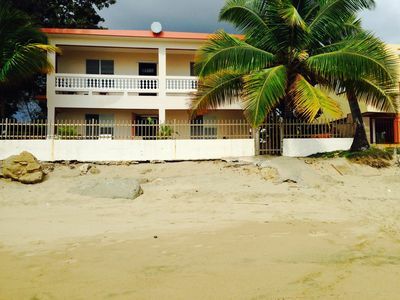 You will need to rent a car or jeep to get around on Vieques. 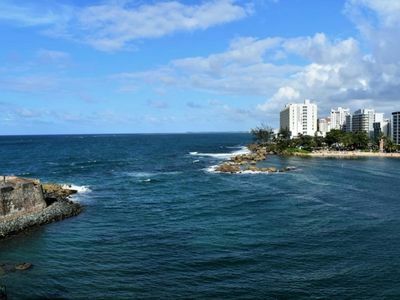 Cars rented on the main island of PR cannot be brought over on the ferry. Here are the car rental agencies we recommend. Especially during December through April you should reserve your car well in advance, as cars can rent up fully during high season. You will have to search for contact info for these agencies yourself as VRBO no longer allows us to post this information. 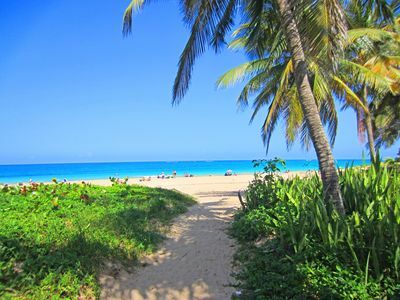 Cell phone from the continental US work in PR and on Vieques without roaming charges. AT&T seems to have the strongest cell signal here, but Verizon and Spring cellphones also work ok here. T-Mobile has the weakest coverage on the island, and only works intermittently at our Villa. None of the carriers provide signal in the furthest corners of the island. Our local property manager Yaritza will plan to meet you when you arrive on the island to lead you to our villa. She is very helpful and is readily available to answer questions or give you tips about island points of interest. You should plan to rent a car or SUV for your stay. In high season this means booking well ahead to guarantee a rental. 4wd is helpful if you plan to visit the most remote beaches, otherwise 2wd will be fine. It takes less than half an hour to drive from one end of the island to the other, but a GPS or cell-phone mapping program is extremely useful for navigating the island, as many roads are not marked, even the main ones. Your house manual contains lots of recommendations for beaches, points of interest, and restaurants, and your house managers are a wealth of information as well. 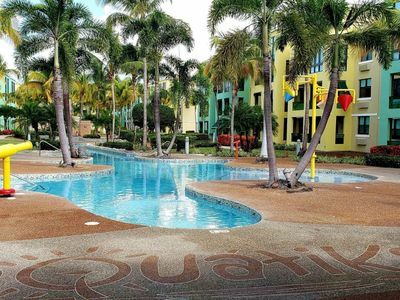 You must be 25 or over to rent at Villa del Sol (the same applies to rental cars on the island). There is no smoking inside, and we expect music and TVs to be played at low volume between 10 pm to 9 am. 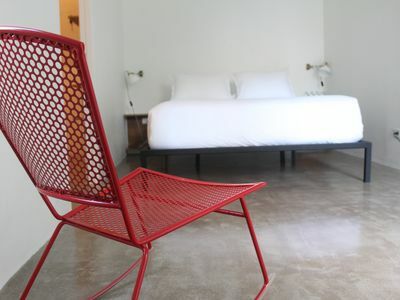 You can look forward to a quiet, restful stay. 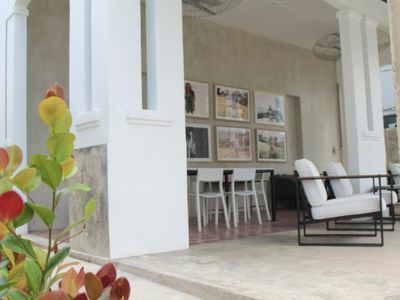 You share the pool area, which is very spacious, with the adjacent apartment and the owners unit upstairs. 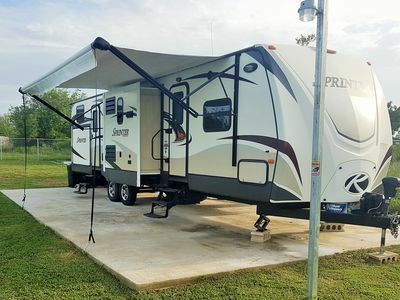 You are welcome to use the available beach gear (coolers, beach chairs, snorkeling equipment), the charcoal BBQ, and the on-site washer/dryer. 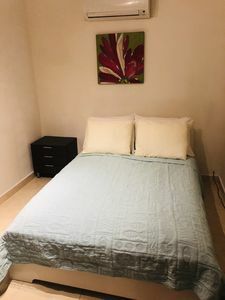 3BR PH Beautiful, quiet and safe, 12min to SJU.